Tragic love affairs, which often ended in double suicides, attracted deep public sympathy both onstage and in life. The love-suicide of Osome and Hisamatsu, which took place in the first decade of the eighteenth century, was so widely known that it quickly became a subject of popular ballads and kabuki plays. This beautiful diptych by the Osaka artist Hokuei conveys much of the emotional resonance of the play's performance in Kyoto in 1833. Iwai Shijaku I (1804- 1845) played both principal roles as well as others for a total of seven in this performance. In this print, the actor is shown playing both lovers, who are each betrothed to another. Onstage, they would appear alternately, appearing and disappearing behind the stage set. The graffiti on the plaster wall of the storehouse gives the names of the lovers beneath an umbrella, followed by oatari (great hit) and "Iwai Shijaku of Kyoto." The design and the exquisite printing of this diptych make it one of Hokuei's finest theatrical prints. 2) in color in Masterpieces of Japanese Prints: The European Collections - Ukiyo-e from the Victoria and Albert Museum, Kodansha International, 1991, p. 129. 3) in color in Ukiyo-e Masterpieces in European Collection 5: Victoria and Albert Museum II, Kodansha, 1989, #152. Osome Hisamatsu ukina no yomiuri (News of the Affair of Osome and Hisamatsu: お染久松色読販) was derived from an actual event, circa 1710, and first recorded in a celebrated ballad (utazaimon). In Osaka, the anonymous Shinjû kimon kado, a kabuki play, was performed in 1710, and a jôruri (puppet play: 淨瑠璃) in 1711 (written by Ki no Kaion). The most familiar dramatization, still performed today, is Shinpan utazaimon ("The Strolling Minstrel's Song Book"), a jôruri by Chikamatsu Hanji (1725-1783) from 1780. The widespread popularity of the tale led to many adaptations. Osome Hisamatsu ukina no yomiuri was written by Tsuruya Nanboku IV and first performed in Edo in 1813. Yomiuri (詠売) were "reading-selling" vendors who sang or chanted the news, most often of an immediate and notorious nature (love suicides, local scandals, samurai vendettas, and so on). Hisamatsu, a destitute nobleman serving as a clerk at the Aburaya pawnshop, is the lover of Osome, although both are betrothed to others (Hisamatsu to Omitsu, Osome to Yamagawa Seibei). Hisamatsu is searching, along with his sister Takegawa, for a stolen family heirloom sword (Goôyoshimitsu, whose loss resulted in their father Ishizu's suicide) pawned by the clerk Kimon no Kihei. The clerk’s spouse Oroku (once a servant to Takekawa, who is trying to raise money for her) joins him in a failed extortion plot. Afterwards, Kihei abducts Osome, but Hisamatsu (who has just escaped from being locked in a storehouse by his half-brother to keep him away from Osome) overtakes them and kills Kihei. The sword Goôyoshimitsu is later reclaimed. After the murder, Hisamatsu and Osome escape to the Sumida river intent on committing shinjû, but they are stopped and survive. 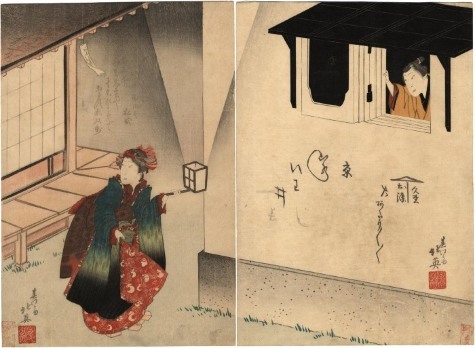 This diptych features the storehouse scene with Hisamatsu watching Osome from a window. Shijaku performs as Osome, one of seven roles in a nanabake (七変化), a series of dances performed by a single actor who never leaves the stage and who takes on the roles, genders, and costumes of the various stage characters. The same Japanese ideograms can also be pronounced nana-henge and shichi-henge (seven transformations: 七変化). These dances were frequently accompanied by on-stage musicians and featured hayagawari (quick-costume changes: 早替り). The role names are written on the storehouse wall under the grafitti of the umbrella. This is the aiaigasa ("sharing-together umbrella": 相合傘), an iconographic symbol of romance and intimacy during the Edo period. The aiaigasa was a device that appeared occasionally in ukiyo-e; it was also cited in popular poetry and literature. When the names of lovers were written beneath a drawing of an umbrella, it was the equivalent of writing names within a heart in the West. This design includes two seals. Hokuei's artist seal reads Fumoto no yuki ("snow on the foothills"). The block-cutter seal reads surimono hori Kasuke ("surimono cut by Kasuke"), the latter indicating a special production by a leading artisan of the period. The inscription above Osome reads Imotose no toshi aioi Hisamatsu ya sono na o somete dedasu e-zôshi ("Husband & wife, a couple of the same age, Hisamatsu & Osome, whose fame was spread in picture-book novels"). This design is one of Hokuei's finest. The carving and printing for Osome's robe is extraordinary. The section above is quoted from Peter Ujlaki.